When launching a new online shop, it is important to consider key technical elements on a strategic level. The first of these is the choice of the underlying shop system. For those starting out in the world of e-commerce, the wide range of available options can appear somewhat confusing. As a small operator with only limited order volumes, however, you are unlikely to need advanced features such as multi-channel tracking or special tools for conversion optimization, for example. Great benefit can be derived from focusing on essential features. An important decision for new merchants is the choice between the two main types of system: an “open-source” solution or cloud-based “software as a service” option. What features are really necessary? After spending weeks or months on your business model, it may be frustrating to spend even more time and effort on setting up your shop. It can therefore be very helpful if the software includes an installation wizard to guide you through the initial steps with your shop. The wizard should also offer a range of design options in line with the latest e-commerce trends and not require any prior technical knowledge on your part. For large online shops, legal issues can be a headache. If you operate a small online store, however, infringing applicable laws could well jeopardise your entire business or result in serious consequences. Furthermore, the statutory guidelines and requirements governing e-commerce are constantly changing. To avoid inadvertently breaking any laws, you will therefore need to ensure that your shop remains up to date on the legal front – potentially a difficult and time-consuming task. You should select a provider that is not only legally compliant at the time your shop opens, but can also react quickly and reliably to the latest changes in the law by automatically updating your shop as and when required. It can also be useful if the system cooperates with providers of legally compliant templates for pages such as the site ownership details or terms and conditions. Mobile browsing and shopping continues to grow at an exponential rate. For example, according to Statista, the number of UK m-commerce users has risen from 22 million in Q3 2013 to 33 million by Q2 2016. Moreover, this trend is likely to intensify in the future. If you are therefore using a shop system that does not include fully mobile-optimized pages, you should consider changing the system as soon as possible. Operating an online shop involves much more than simply offering goods for sale. Behind the scenes, a complex network of features is involved, including payment processing, fulfilment of deliveries and integration with online marketplaces. If, therefore, your shop system cooperates with reputable partners from those fields (such as PayPal, DHL, Amazon and eBay), you will benefit from two clear advantages. Firstly, large-scale partners of this type can help make your entire order fulfilment process run smoothly. Secondly, your customers will gain confidence in your shop from seeing these household names on your site. They will therefore be much more likely to buy from you. If your shop offers only a few products, you are unlikely to need a complex product search function, as customers will easily be able to find what they are looking for. Once the number of products rises, however, this can rapidly change. You should then review how well the store’s search function is working. Can customers apply filters to their searches, for example, to make the search results more precise? This feature is often missing or poorly implemented even on some of the larger shopping sites. An optimal search function can therefore give your site a significant market advantage and a boost to conversion rates, particularly in view of the fact that searching is often the first thing a visitor does in an online shop. Smaller shops rarely have access to a large budget, to pay for AdWords campaigns, for instance. If customers are to successfully locate your online shop, it will therefore need to be properly search engine-optimized. Many shop systems include an integrated SEO kit. This can help to ensure that your shop is found by search engines, resulting in a steady stream of new customers. Specialist or niche-product shops, in particular, can derive substantial value from an effective SEO strategy as they tend to have a clear idea of their competition. Nonetheless, correct use of the SEO kit is vital, as search engine optimization is an ongoing process that requires regular monitoring and adjustment. Trustmarks of the type provided by Trusted Shops and TrustPilot, for example, can improve a shop’s conversion rate by up to 10 percent and increase total sales by a massive 17 percent, according to a recent study by Explido. If a shop system cooperates with a trustmark provider, this indicates that the underlying design of the shop platform complies with the provider’s certification requirements. Retailers will not therefore need to spend time optimizing your shop and can benefit from the advantages of a trustmark. For many sectors it is essential to be able to set up and offer different product variants. Consider, for example, T-shirts that come in a range of colors and sizes. A shop system that incorporates product variations of this type will therefore benefit both merchants and customers. 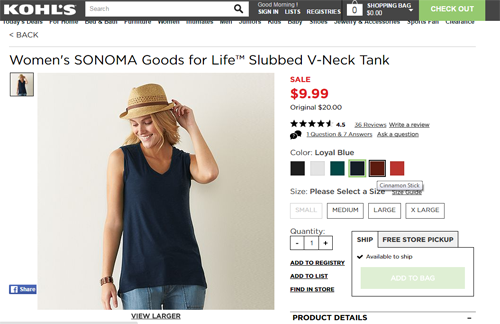 For the retailer, there is no need to set up each T-shirt color as a separate product, while customers appreciate the straightforward navigation that allows them to switch between the red and black versions of a T-shirt within just one click. Virtually every online shop starts off as a small-scale operation. Nevertheless, once sales levels increase, most merchants will want to expand their product range and optimise their store. Some shop systems, however, offer only limited expansion options. If these turn out to be insufficient, you may need to move your shop to another platform – a process that can be tiresome and costly and that will almost certainly involve some system downtime. It is therefore better to begin by selecting a provider with the capability to cope with future expansion. Integration with a merchandise management (or enterprise resource planning) system that generates invoices automatically, for instance, can also prove useful as order volumes grow. If you sell via multiple channels (such as a brick-and-mortar outlets, a mail order catalogue, and the Internet), a system of this type is essential for keeping track of your inventories in a synchronized way. E-commerce is becoming an increasingly cross border activity. Even operators of small-scale shops should therefore consider expansion into foreign markets. To achieve this, however, your site will need to be translated into different languages and in most cases set up to work with other currencies. Many modern shop systems provide support for this internationalization process. A service of this type should therefore definitely be available for any move into cross-border sales. An Open-source solution or Software as a Service? Decisions about the correct system for your shop are further complicated by the differing approaches taken by the various software vendors. In the segment serving the SMB market, two main solutions have come to the fore: “open-source” software, and cloud-based “software as a service” (SaaS). These differ from one another in a number of fundamental ways. It is therefore vital that, as an online retailer, you understand the advantages and disadvantages involved with each option. For setting up a SaaS shop system, no programming skills are required. Most systems of this type include online wizards – in other words, step-by-step guides – to support the configuration process. These enable merchants to begin trading immediately. In contrast, open-source software first needs to be installed, for example by the shop operator themselves. If the merchant lacks the necessary technical expertise, an agency can be commissioned to carry out the installation, though this will involve additional expense. SaaS solutions are generally available on a monthly fee basis. In such cases, merchants can usually opt to pay a low rate initially before switching to a higher monthly charge when enhanced capacity, performance levels or additional features are required. Open-source solutions, in contrast, tend to be free of charge and can therefore appear attractive at first sight. However, the costs of installation, maintenance and expansion can be difficult to calculate and can often turn out to be higher than with SaaS solutions. In most cases, SaaS solutions incorporate design templates that online retailers can modify in line with their requirements. Design services can be used as an additional option if merchants feel they lack the necessary design skills. The benefit of open-source solutions, on the other hand, lies in their freely available source code, which can be modified as required by shop operators or their agencies. As a result, the online store can be customized with total flexibility to fit the retailer’s precise requirements. When a new e-commerce operation is launched, it is often difficult to predict what level of growth will result in the future. SaaS users, however, can respond to changing order volumes by moving seamlessly to a higher-level package or even migrating to a customized enterprise solution if their requirements become more complex. Merchants using open-source software will need to plan out the resources needed for their future growth when starting up or else make their own arrangements for upgrading. With a SaaS system, the data and software associated with an online shop are stored by the provider, in secure data centre environment. This keeps the level of risk to a minimum, as data security is handled by the hosting provider and the software is constantly monitored. These aspects can be somewhat problematic with open-source software, as any security vulnerability could be present in the source code and could potentially be exploited by cyber-criminals. If, however, open-source users stay alert and responsive to such risks, they can resolve such vulnerabilities independently. Users of a software as a service solution benefit from regular and free-of-charge updates that are implemented automatically. These ensure that their shops remain compliant with the law, security standards and perform according to the latest version. With open-source systems, the responsibility remains with the shop operators, who therefore need to keep themselves informed of any vital changes and apply the updates to their system themselves. Modern shop systems provide online retailers with a wide variety of options for integration with external services, such as those provided by payment or logistics partners. With cloud-based software as a service shops, these are either pre-installed or can be obtained separately from an app store. The automatic updating of such add-ons saves merchants a high degree of time and effort. The advantage of open-source solutions, in contrast, lies in the large community of developers who are constantly releasing new applications. There is no “one-size-fits-all” shop system that will suit every single e-commerce project. Decisions in this area depend much more on a merchant’s particular requirements and especially on the size and scope of their online shop. For smaller merchants with a restricted budget and limited technical knowledge, SaaS solutions are generally the best all round option. These can provide you with a complete solution at low cost, allowing you to concentrate fully on your core business. At the same time, the danger of any security or performance risks are kept to a minimum. Open-source solutions, in contrast, are primarily suited to larger-scale operators with access to the resources needed for installing and maintaining the shop software themselves or contracting an agency to do this. Such retailers often have very specific requirements for their online shop that can be best fulfilled by means of a customised, open-source solution. Richard Stevenson is Head of Corporate Communications for cloud-driven online shop software provider ePages.com. He has worked in the Web hosting, domain name and Software-as-a-Service industries for over 13 years, many of which working with SMEs and Web pros all over the world to drive awareness and adoption of new Web technologies.